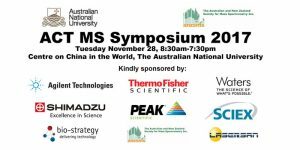 ACT Mass Spectrometry Symposium 2017, Tuesday November 28, 2017. Get in QUICKLY because seats a strictly limited! The ACT Mass Spectrometry Symposium is intended as an interactive forum for experts and novices to discuss the application of mass spectrometry to solving problems and to allow the dissemination of current and future trends in the technology. The speakers represent academic and commercial backgrounds and will cover a wide range of applications as can be seen in the programme below. Orbitrap DIA; Beyond ID’s for your Proteomic Needs. SelexION®+; Improving Triple-Quadrupole Selectivity with Differential Mobility Spectrometry (DMS) to Reach Lower Limits of Quantitation. We have a few new opportunities for you and the monthly GPC e-bulletin. The 2018 Peter Goldacre award is open. Nominations close 9 December 2017. Apply here. The 2018 ASPS teaching award is open. Applications close 9 December 2017. Apply here. The RN Robertson Travelling Fellowship award is open. Applications close 19th January 2018. Apply here. A new employment opportunity has been posted. More details here. A conference added to our events page. more details here. The STA Executive Committee closes on Monday 6 November. You will find details at https://scienceandtechnologyaustralia.org.au/search-begins-for-stem-leaders-to-join-sta-executive-committee/. Voting will take place at the AGM on 23 November. Please consider applying. The registration for Plant Biology Europe 2018, hosted by two of our Member Organizations (EPSO and FESPB) has just opened, and we are excited to announce that the organizing committee have included the option for delegates to donate €5 to the Global Plant Council during registration. If you know of anyone who will be attending the conference, please do send them a link to our website (http://globalplantcouncil.org/) so they can read all about how we support collaboration and innovation in plant science around the world. In Journal of Experimental Botany: Persulfidation in plants: the new phosphorylation? Aroca et al. looked at the whole Arabidopsis persulfidome, a significant undertaking but one which will be immensely valuable for the field. Over 2000 persulfidated proteins were identified in wild-type plants. Researchers describe an ancient loosening up of a key biochemical pathway that set the stage for the ancestors of beets to develop their characteristic red pigment. By evolving an efficient way to make the amino acid tyrosine, the raw material for the new red, this plant family freed up extra tyrosine for more uses. Researchers have discovered how plants can defend themselves against aphids. They recorded aphid behavior on video, and identified a plant protein that keeps aphids from feeding. Salt tolerance in quinoa is found to result from their production of bladder cells, which sequester salt and protect salt-sensitive metabolic processes in other cells. 26–27 March 2018. Bristol, UK.